1977 was a great year. Star Wars came out in the cinemas. The Queen had her Silver Jubilee (where I got to dress up like a policeman in our school parade). 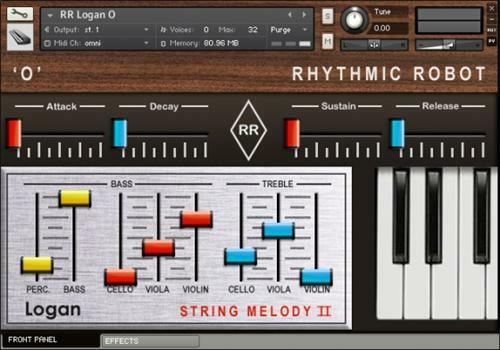 And the Logan String Melody II was released. The String Melody had come out a few years earlier, in 72, but hadn't been much of a hit. The mk II changed all that, earning itself a spot in the pantheon of All Time Greats. It looked stunning, with lavish 1970s real wood veneer and a delightfully responsive waterfall keyboard that made it a real player's instrument. But that wasn't why it was a hit. The reason is very simply to do with the sound it makes. It doesn't sound much like a real string ensemble, but it sounds amazing regardless, and it's graced a thousand hit tracks as a result. It's thick, warm, rich, thoroughly analogue, and yet at the same time airy. And we've sampled every last wonderful resonance of it for you! The Logan String Melody II bunches most of its controls within easy reach of the player's left hand, so let's take a quick guided tour. The silver push-buttons are the Preset selectors. Each of these engages one of the Presets: a combination of string settings, chorus settings, and LFOs that defines the basic sound the keyboard makes. The red and blue "String" faders operate like typical organ drawbars: top is off, bottom is loud. They control three String registrations per set - Cello, Viola and Violin - which are effectively the same tone but played at pitch for the Cello, then one octave higher for Viola, and two octaves higher for Violin. Mixing these up is very simple and gives you an instant orchestral ensemble effect. The red drawbars control the sound to the left of Middle C and the blue ones control the sound to the right, so you can set them identically for a whole keyboard of string wonderfulness, or have different registrations in the bass and treble. The yellow drawbars are for the Bass tones: Perc, which is a one-shot percussive bass sound, and Bass, which is a good deep analogue growl. These can be blended in to the String sounds, but they only operate to the left of Middle C. Or you can disable the String drawbars and just play the bass sounds on their own, for really deep analogue bass tones. They sound gorgeous. So on the original Logan, the sounds that emerge alter drastically depending on which Preset you have engaged. The Organ preset sounds utterly different to the Orch. preset. This was part of the reason that we broke our Rhythmic Robot version of the instrument out into five separate Kontakt instruments. What you get, then, is five Kontakt instruments, one for each of the Presets - so you can load them individually to mimic the original Logan, or stack them up any way you like for even richer, thicker, warmer stringscapes! There was no way to do this on the original, since engaging one Preset popped out the buttons for all the others. But hey, this is a whole new millennium, and now you can have Organ with Acc., or �?O' with Orch., or even the whole damn lot of them blended up into a sumptuous frenzy of swirling chorus and swooping LFOs. Let's go crazy! There's more. We thought you'd like a bit more control than just Attack and Release, so we've slotted in a standard ADSR envelope on the front panel. Round the back, there's more still: additional Chorus and Phaser effects (so you can add Chorus to, say, the Acc. setting, which doesn't usually have it), plus separate Vibrato and Tremolo controls (with Depth and Rate), a nice warm Tube distortion circuit, and a set of cab models to emulate the sound of the Logan playing through an amp. These open up a whole wealth of different soundscape possibilities: we particularly like the cab effects, since the naturally spacious sound of the Logan can be made growly, dark, glowering and sinister with one cab, or thinned and made "smaller" for easier siting in a busy mix with another. This is where you'll find the opportunities to build your own tones that extend far beyond the palette of the original instrument. We really went to town on the sampling, too. Each chromatic note of the four-octave keyboard was sampled at 24-bit, for each of the registration stops, on each of the presets. These are long samples, too, to give the sound time to evolve, and they've been looped very carefully to preserve the cyclical components of the chorus effect. This makes Logan one of our larger instruments in terms of sheer Megabytage, but we really think it's worth it. Rhythmic Robot Audio Logan KONTAKT download links are externally hosted on Extabit, Rapidshare, Rapidgator, Netload, Uploaded and Rhythmic Robot Audio Logan KONTAKT also available directly on Torrent Sources.